SHUTTER MATERIALS » Window covering - Shutters - Blinds | AE BLINDS & SHUTTERS, INC.
Our Energy Efficient Shutters is a hybrid product that only we offer. We as a manufacturer saw the durability of Polywood and the lightness of wood and decided to combine them together for a much better and efficient product. This is by far our most popular product. It comes with poly louvers and with all other wood components (frames, stiles, top and bottom rails) This product only comes in painted colors. We can provide the client/homeowner with a paint strike off before the shutters are painted to ensure a good paint match. 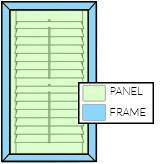 Our 100% Painted Wood shutters are made out of the finest American hardwood available. We find wood shutters to be light and durable and to stand up to the test of time. We use top quality paint from Sherwin Williams to ensure durability and a long lasting shutter. We can provide the client/homeowner with a paint strike off before the shutters are painted to ensure a good paint match. Our 100% Stained Wood shutters are also made out of the finest American Basswood available. We take care in choosing wood with attractive wood grain so that it comes through beautifully through the stain that is chosen. We use top quality stains from Sherwin Williams to ensure durable and long lasting shutters. We even go a step further for stained colors and send out a Light, Medium, and Dark (L,M,D) set of samples for the customer to choose from in the home. We can provide the client/homeowner with a paint strike off before the shutters are painted to ensure a good paint match. Custom paint/stain colors are available at no extra charge. We just need a sample to be provided to be able to custom match a color. 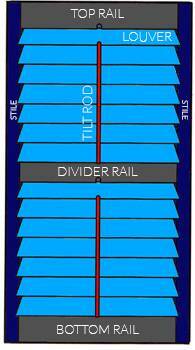 Tilt rods are located in the center of the panel and controls the movements of the louvers by connecting them together. Louvers are the components that rotate to offer control over the light and view. 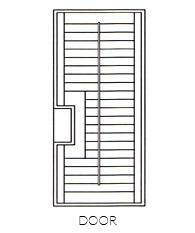 Stiles are the vertical side peices of the panel that are secured to the horizontal rails. The stiles hold the louvers into place and keeps them evenly spaced for proper operation. also enables the louvers in the upper section section to move independently from the lower section. Fan top shutters provide the finishing touch to any decor with their ability to show shutters in their best light. The louvers are movable by connecting directly to the hub and the frame. Fan top shutters are also available as an eyebrow. 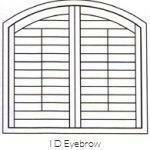 ID eyebrows are shutters that cover an arched opening. The panels are manufactured with a curved top rail. 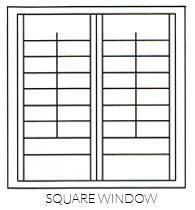 Square window shutters are the most commonly used type of shutter. 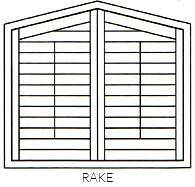 Rake top shutters have a straight angled top along with an angled top rail to conform with the opening. Doors sometime come with a lever type of handle which protrudes into the glass section of the door. In this case we have a circle or rectangluar cut out to accommodate this section.